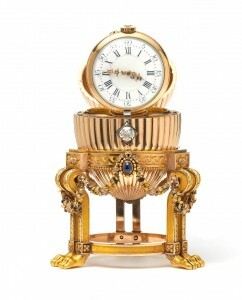 Faberge Egg by the Russian Imperial Jeweller. Wartski jewellers 14 Grafton Street, Mayfair will be showing the Faberge, gold & diamond Easter Egg, circa 1887,once given to Empress Maria Feodorovna by Emperor Alexander 111. Recently rediscovered in America at a scrap metal merchants. 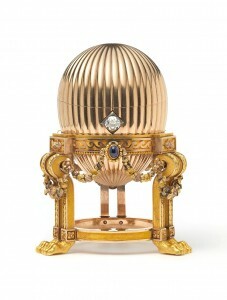 Faberge Easter Egg amazingly rediscovered in America after having been “lost” for decades. Wartski Jewellers will be putting the Faberge egg on show for 4 days only 14-18th April 2014, at their shop on 14 Grafton street Mayfair, London. The gold and diamond egg hides a magnificent Vacheron & Constantin watch. The egg, 8.2 cms in height, was made in the workshop of Faberge’s chief jeweller, August Holmstrom, in St Petersburg 1886-1887. Emperor Alexander 111 gave the Faberge egg to the Empress Maria Feodorovna Easter 1887.